Knowle and Dorridge Racquets Club has approximately 700 members of whom 440 are adult playing members, 120 are juniors and 140 are social members. The Club has 8 tennis courts. 4 floodlit Astroturf , 3 New Generation Astroturf Courts of which 2 are lit by LED floodlights and 1 singles/mini tennis New Generation Astroturf court. Courts are open 7 days a week from 9.00am to 10.00pm. 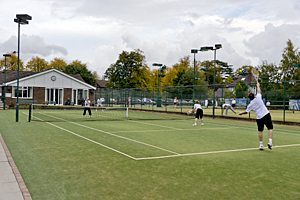 There is a court for singles play and the club offers a wide range of social and team tennis. 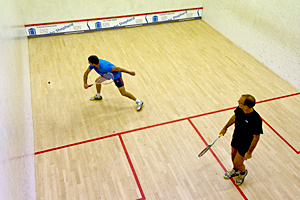 The club has two squash courts situated beyond the tennis courts with a balcony over both for the use of spectators and referees. The club was founded in 1908 originally as a tennis club only, with 6 courts and a modest clubhouse. In the early 1960’s the first of its 2 squash courts was built with the second being added in the 1970’s. Racketball, which is played on the squash courts was well established by 1995 and there are now more players of racketball than squash. 2018 saw the addition of 4 New Generation Astroturf courts, 2 of which are floodlit by state of the art LED floodlights and the singles court also being marked for mini tennis. You can join the club to play tennis or squash and racketball or can play all three sports at a greatly reduced rate. The club suits those who wish to play socially as well as those seeking to play competitively. If you are interested in tennis you should follow this link for more information. If it’s squash and racketball then follow this link.